Ugh, what a miserable couple of weeks here with the spread of influenza :-P First my 2 YO, then me, now I think DH has it. I sure hope the other two don't come down with this. Not fun:-( So, before the projects I started on "expire" I want to post what I have finished. Thank you Ros, I do apologize. It was close to midnight here so I was a little glazed over. Which one was your challenge? This is great. I do not get the whole mustache craze, but I must admit it makes me smile. Adorable card, hope everyone feels better. Thanks for joining us at PTT. Adorable card!! I love the all the green. Fabulous card. Hope everyone feels better soon. It is rough when our kids and/or husband is sick. Even worse when you are sick too. I love the name of your blog. I am your newest follower and would love for you to follow my blog too. Just fantastic I love all the colors. what a fun card. Thanks for joing us at the scrappy frog challange. Hope to see you again. Hope you are all on the mend soon!!! Such a fun card! Thanks for sharing it with us at Clear It Out! Hope to see more of your work. Now this is a card I could have used this past weekend at our friend's St. Patrick's day party. This card is adorable and hope you're all feeling better. Thanks for sharing. Jearise from Scrappy Frog Challenge. Tammy this is adorable! I am sure he is 10 times cuter in person too with the wobble going on. ;) I hope everyone in your home feels better asap! Thank you so much for playing along in our Green challenge over at The Pink Elephant! Very nice project! 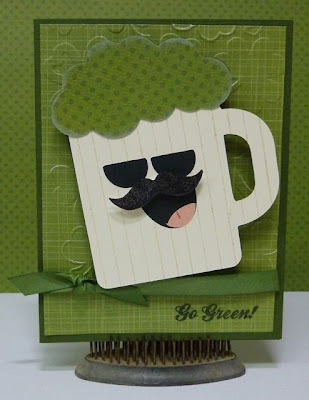 Thanks for sharing it with us at Crafter's Cafe Challenge Blog! This is so fun!! So glad you shared with us this month at The Crafter's Cafe Challenge Blog! Hope to see you again soon!